This morning the ABS released its survey of private new capital expenditure and expected expenditure, the big brother to yesterday’s construction work done release. Construction work done is based on the value of projects being undertaken by construction companies, whereas today’s release is based on the capitalised value of those projects to the businesses paying for them, as reported in their financial statements. Encouragingly, the headline figure rose to a seasonally-adjusted $32.6bn, up 1.1% on the previous quarter, while the trend (a moving average of the previous 7 quarters) continued to decline. 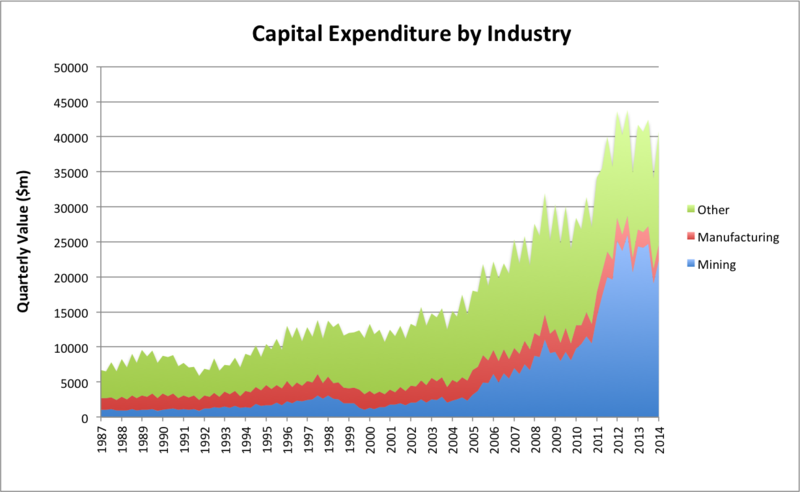 This level of capital expenditure remains very high by historical standards (h/t RBA). And it’s been almost entirely driven by investment in the resources sector. There have been well-publicised concerns that this bloated level of mining investment could reverse quickly, leaving a hole in the economy which will be difficult to fill (the ‘mining cliff’, as some referred to this scenario). 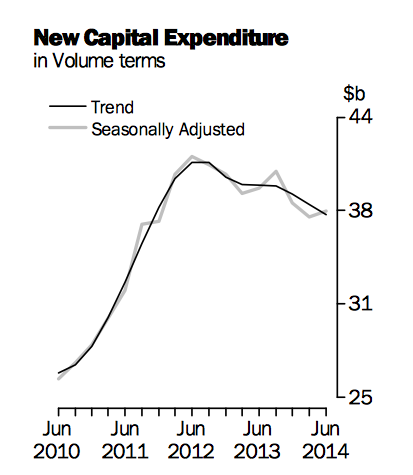 It’s therefore welcome to see capex continue to bounce along at elevated levels. Nevertheless, with the winding down of investment in LNG export capacity drawing ever-nearer, and the stubborn exchange rate rendering new investment difficult to justify in any industry outside home-building, there remains significant downside risks to this figure going forward. This is somewhat reflected in expectations for new capex in 2014-2015, which continue to show a decline from last year, albeit well above initial forecasts. In all, the release surpassed expectations and indicates a gentler descent than had previously been expected. Raining on capex’s parade today was the advancing rout in iron ore prices, which are exhibiting all the trappings of a classic Q3 capitulation. This observed pattern in iron ore prices reflects seasonal conditions in China. As the days grow shorter, construction work slows and demand for input materials cools. Chief among these are steel and iron ore. 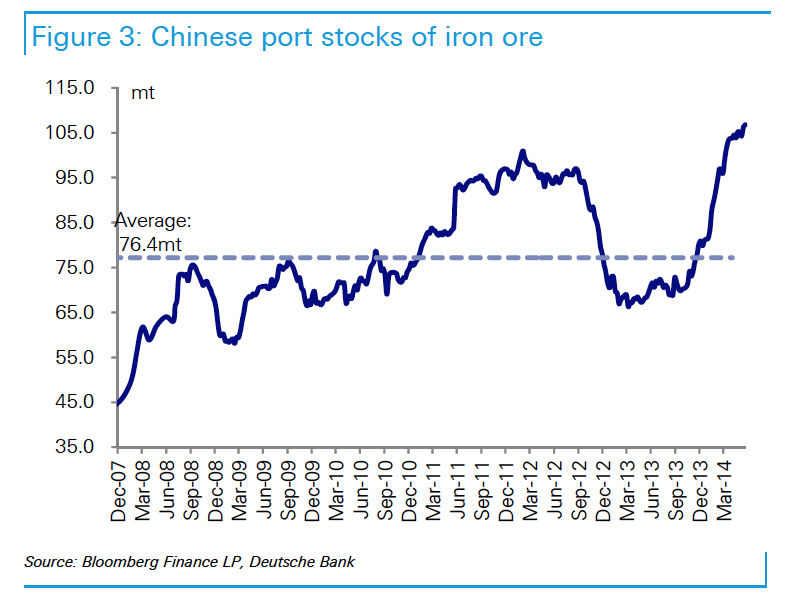 This tradition was interrupted last year, largely as a result of stimulus measures from the Chinese government and a consequent build-up of iron ore inventories at Chinese ports. Notably, this surge in port stocks merely held prices in a tight range, and we didn’t see the usual run up in prices into the year’s end. Once the rate of increase in stockpiles slowed this year, prices could not withstand the onslaught of new supply and tumbled accordingly, with spot now down almost 40% for the year in AUD-terms. Spot is now a mere $1.50 above its September 2012 low. 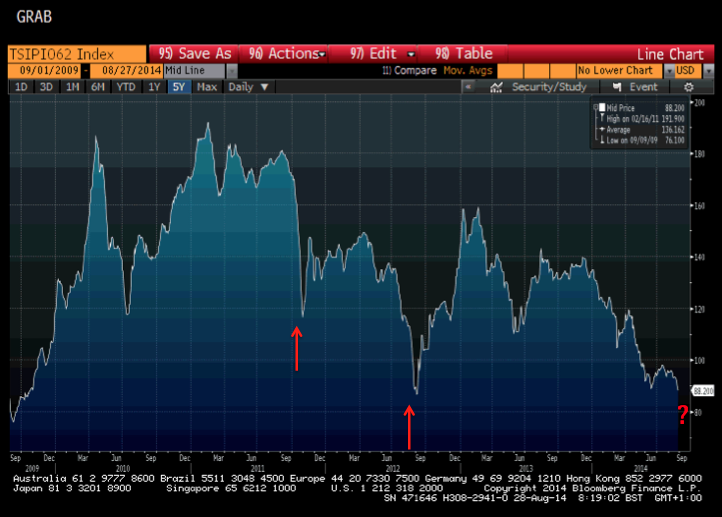 It is quite possible that we see this go tonight and iron ore fall to its lowest level since 2009. If it does, there’s nothing but air all the way down to… who knows, picking a bottom is crapshoot, but a bottom it will find. Once it does, it should bounce back strongly. But this is very much a market of lower lows and lower highs, the glory days are long behind and there is precious little comprehension in the national psyche of the ramifications of this new reality. Hold on to your hardhat, Gina! This entry was posted in Capex, iron ore, mining on August 28, 2014 by MJV.